The opportunity to observe the behavior of actual tsunamis in Alaska is rare—we have been fortunate to avoid a truly devastating one for more than a half century. However, the M7.9 Offshore Kodiak earthquake that occurred on January 23 offered one of these rare opportunities. Though coastal communities across Alaska evacuated on a chilly evening after midnight, the earthquake fractured the ground in ways that did not create a lot of uplift on the seafloor. The resulting tsunami was modest and the many evacuation efforts turned out to be excellent drills. While the largest observed waves were only about a half-meter high, this was more than sufficient to demonstrate patterns in wave height, time of arrival, and secondary waves. Tide gauges, most operated by our friends at the National Tsunami Warning Center and the National Weather Service, recorded the small tsunami with excellent fidelity. From the Alaska Peninsula to Southeast, these tidal records provide real-world evidence about how tsunamis behave and how they interact with the Alaska coastline, regardless of size. These rare observations are quite valuable and can be used to validate the behaviors predicted by computer models. This infographic highlights some of the observations from the early morning of January 23 that we feel are most interesting and pertinent. 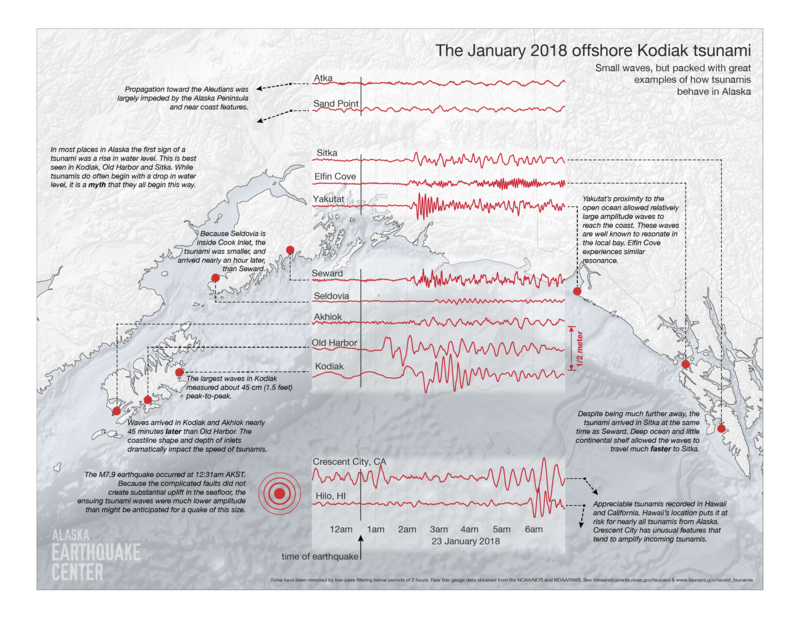 Recordings of tsunami waves following the M7.9 Offshore Kodiak earthquake on January 23, 2018.